This winter, GottaBe! 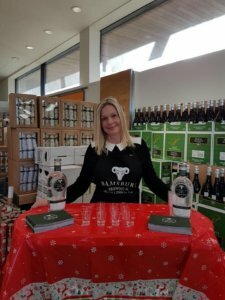 Marketing were running exciting sampling campaign with Ramsbury Gin. At the Ramsbury Estate, they make gin, vodka and a whole host of other products from scratch, its pure and simple. The team at Gottabe! along with the Brand Ambassadors were going to a variety of Waitrose shops to sample the products to the public. 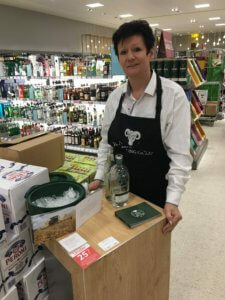 The gin sampling took placeacross the south west of the country and included stores such as Marlborough, Swindon, Newbury, Andover, Wantage, Wallingford, Thatcham, Melksham and Abingdon. Sampling in Waitrose is a great way of promoting the brand and the Waitrose chain itself. It is important to sample the products within the South West of country because that is where Ramsbury Distillery originates and they have their own shop in Marlborough, Wiltshire. What makes this product so special is the way it has been distilled from Horartio wheat, and grown in the fields on the estate. The main role of the Brand Ambassadors was to approach customers that were shop ping at the store in an exciting and friendly way to increase Ramsbury’s exposure. However, as gin is alcohol, the person who is sampling, must make sure that whoever is trying the product, is over the age of 18 and all of our staff complied with Challenge 25 scheme. Lisa Sawyer, a brand ambassador who has worked for GottaBe! for a few years now said “I thoroughly enjoyed working on this campaign. I enjoy engaging with the public, and we build up a rapport”. Direct marketing, such as product sampling is a great way of drawing attention to your brand and what you offer as it gives the public a taster and if they like it, they’re more likely to come back for more. Allowing people to physically do something, gives them more of a chance of remembering. Story written by Shannon Dunne, Account Support Executive at GottaBe!.